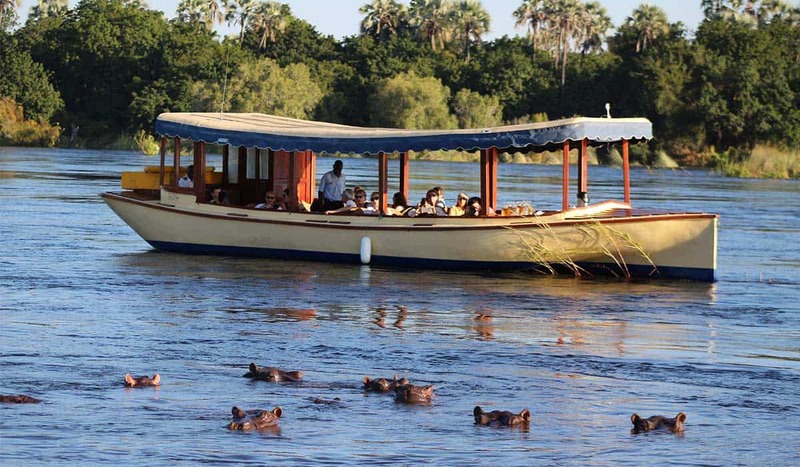 Choices abound on the Ra-Ikane fleet for a variety of Zambezi River cruises. Whatever cruise you choose, remember to wear your sneakers and take along your camera, some sunscreen, a hat, sunglasses and a great sense of curiosity – there is so much to see and experience on these river cruises! All river cruise bookings can be made through one of our activities agents at the Guest Activities desk or emailed to raikane@ilalalodge.co.zw. Enjoy freshly brewed coffee and a continental breakfast as you cruise up the Zambezi River towards Kandahar Island while enjoying the sounds of the diverse birdlife and the African bush come to life in the early morning. Breakfast includes freshly baked breads and pastries, fresh fruit platters, jams, yoghurts and cheeses as well as an assortment of teas and coffee. Sit back and relax while sipping a cold drink and enjoying a few quiet hours along the banks of the Zambezi River. Our lunch buffet includes cold meats, fresh salads and a wide selection of biscuits and cheeses, all catered by the award-winning Palm Restaurant at Ilala Lodge Hotel. The fully stocked bar is available throughout the cruise and the attentive crew is at your service. There simply is not a better way to enjoy the dazzling African sunset than from the comfort of a Ra-Ikane boat on a sunset cruise on the Zambezi River. Our ever-popular sunset cruise offers a unique way to explore the channels of the river and to get an up-close view of the pristine wilderness and African game along its banks. Enjoy an array of canapés, a full bar and a charming crew who can impart a bit of interesting Victoria Falls history with you on board the Ra-Ikane. You know what they say about the early bird? If you are a passionate birdwatcher, don’t miss out on this river cruise! Keen bird lovers will delight in marking off their sightings in the birding booklet provided on board while enjoying a delicious continental breakfast including fruit platters, fresh pastries and a variety of cheeses and biscuits. Rare birds such as the African Pitta and the Narina Trogon have been sighted here, as well as hundreds of other bird species. The knowledgeable and experienced guides conduct these early morning river cruises.